We provide our clients with the most cost-effective patented solutions and corrosion-mitigation requirements. Our supports also distribute the pipe load evenly across the whole width of the beam, allowing higher beam loading capacities. Our support solutions are applicable to all uninsulated piping for all industries. NO HOT WORK IS REQUIRED. All “Lift-Off” Pipe Supports products are safe, environmentally friendly, and manufactured in the USA. Click on a picture below to view our Products Page. Contact us today to discuss your facility’s needs. “Lift-Off” Pipe Supports is the brand name of a new product offering that is proving to be a huge benefit for the industries where pipe supports are failing and having to be replaced. Nominated for the 2019 Innovation Award of NACE International, “Lift-Off” Rests (LOR) finished in the final 5 in the “Materials and Design Category” of 41 entries. 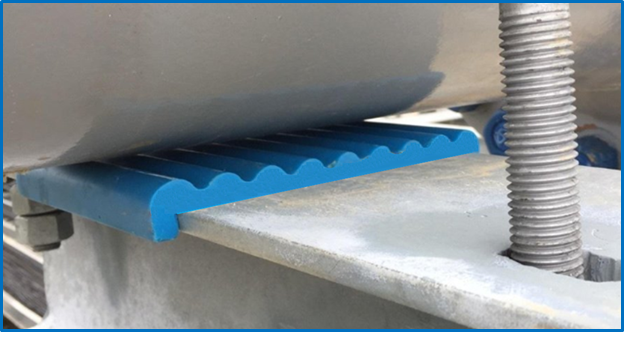 The “Lift-Off” Pipe Rest (LOR) is a glass-reinforced composite resin pipe support providing a noncorrosive barrier between pipes and beams to eliminate corrosion, designed to meet the thermal and mechanical requirements of load-bearing supports. This innovative pipe support does not absorb moisture, spreads the pipe load equally over at least four times greater area than existing supports, does not contribute to distortion of the underlying support beam, prevents electrolysis, and is rated for use at temperatures as low as -265 °F (-165 °C) and as high as 412 °F (211.1 °C, continuous) and up to 550 °F (287.8 °C, intermittent). The LOR continually maintains position without external support and is designed with grooves for fluid shedding and additional corrosion protection.